With about a month left before summer is officially over, I am scrambling to make as many dishes utilizing what the season has to offer. Even though I'm much more of an autumn and winter fan, summer produce yields my favorite fruits to eat: watermelon, stone fruit, and berries. Although living in California allows me to eat some of these fruits year round, nothing compares to when these fruits are at their peak of ripeness. The recipe I am giving you today was not what I had planned exactly. I was testing a roasted bourbon-peach sherbet and after a few trials, I ended up axing the recipe altogether. Alex gave his seal of approval, but from the process to the finished product, I came across a bunch of problems and in the end, I couldn't stand behind the recipe nor could I share it with you. Maybe I'll try it again next summer when I haven't reached my limit of purchasing peaches yet. With that said, I want to be clear that today's ice cream recipe is no consolation prize, and in fact, I'm looking at the peach sherbet failure as a blessing in disguise. I realized that I hadn't shared my go-to vanilla ice cream recipe yet and instead of just giving you the recipe for that straight-up, I wanted to add something to it highlighting a summer ingredient. Enter: roasted strawberries. Let me preface this by saying that growing up I never EVER cared for ice creams that didn't have some kind of chocolate element to them. Chocolate chip cookie dough, mint chocolate chip, cookies 'n cream... these were all my favorites. Flavors like pistachio, strawberry, cherry, or butter pecan, were all a no-go for me. Fortunately, I've outgrown my narrow-mindedness in the ice cream department, and can earnestly say that this roasted strawberry and vanilla ice cream is in my top 5 favorite flavors. Roasting the strawberries in honey and a bit of balsamic vinegar gives it such a unique flavor that isn't overpowering to the vanilla, and leaves you with a complete fresh taste. It's truly incredible. I divided up the recipe so that if you 0nly want to make the vanilla ice cream, and trust me, you'll want to, the directions and ingredients are there for you. I've made this vanilla ice cream countless times and it's so creamy and refreshing that I will probably never bother trying to find another recipe. As for the roasted strawberries, there's one tip that I want to give: the larger you leave the roasted strawberries when cutting them before adding to the ice cream base, the bigger chance of them becoming icy when in placed in the freezer. As you can see in the pictures, I chose to leave the strawberries larger because I think it looks beautiful, and I personally wasn't phased by the texture of the berries. If you think that will bother you, simply puree the berries in a blender. 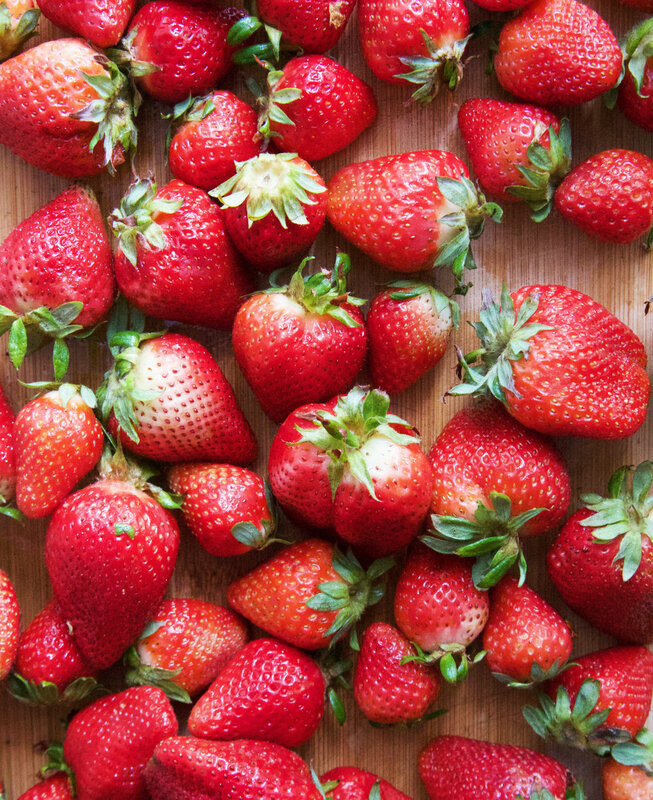 In a medium size bowl, mix the strawberries, honey, and balsamic vinegar and transfer to the baking sheet, making sure to scrape out everything from the bowl. Bake in the oven for about 35-40 minutes, stirring the strawberries once halfway through. The berries will appear well-cooked, a bit browned, and the juices will be bubbling. Allow the berries to cool for about 15 minutes on the baking sheet. Using a knife or kitchen scissors, roughly cut up the berries so there will be bigger chunks in the ice cream. Transfer to a bowl, making sure to get all the juices from the parchment paper and chill completely until ready for the ice cream. Alternately, you can transfer the berries to a blender and purée them if you wish to have a smooth ice cream consistency. In a large bowl, add 1 cup of the heavy cream and set a strainer over the top (use a bowl that will be able to fit over an ice bath for later). Warm the milk, 1 cup of heavy cream, sugar, and salt in a saucepan over medium-low heat. In a medium bowl, whisk the egg yolks together. Just as the milk mixture is beginning to simmer, gradually add some of it to the bowl of egg yolks, whisking constantly as to not scramble the eggs (this is called tempering). Once the egg yolk mixture temperature has raised, pour the mixture back into the saucepan. Stir constantly over medium-low heat until the mixture thickens and coats the back of your spatula or spoon. Pour the custard mixture over the strainer-lined bowl. Stir the custard in with the heavy cream that is already in the bowl and add in the vanilla extract. Let the ice cream base sit over an ice bath for about an hour before moving to the refrigerator. Chill for at least 4 hours, or overnight. When ready to churn, mix the roasted strawberry mixture with the custard ice cream base. Add the lemon juice. Churn the ice cream in your maker according to the manufacturer's instructions. Transfer the finished ice cream to an airtight container and freeze until solid. Enjoy! The day has finally arrived: welcome to my blog, The Vivid Kitchen! After a few years of posting and sharing recipes on my Instagram account and countless times being asked “Do you have a blog?... Why don’t you have a blog?! ?” from friends, family and acquaintances, I have finally decided to create a space for myself to channel my love for all things food related. A bit of my background: I was born and raised in Los Angeles, California, and currently live in Orange County with my very supportive and hungry boyfriend, Alex. Even though baking is such an integral part of my life at the moment, I didn’t get into it until I graduated from college. Growing up, I wasn’t the kind of kid who helped her grandmother with baking pies or cheesecakes, I just happily ate it... all of it. After I graduated from college in Chicago, Illinois I moved back home and kind of fell into a slump that most post-graduates can relate to. I wasn’t happy with my life and didn’t know exactly what I wanted to do with it, and it was in that mess that I discovered baking from scratch. I have a background in photography and so whenever I baked something, my favorite thing was photographing the finished product, even it was just a simple batch of cookies that I made for myself. My parents must have noticed how happy my hobby was making me and so for Christmas that year they gifted me with a Kitchenaid stand mixer and an ice cream maker. Those two amazing gifts were the catalyst that led to my love for baking. My posts will focus primarily on the sweet side, ranging from breakfast pastries (muffins, scones) to favorite desserts (cookies, cakes) and everything in between (I’m a huge ice cream fan). Furthermore, I will post savory dishes as well as cocktail recipes, and every now and then will include travel posts with photo diaries. I want to stress that I am a self-taught baker! I have pretty much learned how to bake everything on my own and I still have many struggles in the kitchen (baking cheesecake gives me stomach ulcers). But what is important here is that if I can bake these recipes, I have no doubt in my mind that anyone can! Ok enough small talk, let's get to the cobbler. I have made this strawberry cobbler a few times and every time I do I ask myself why I don't make it every other week. There are few things better in life than a spoonful of warm, roasted strawberries with a bit of cobbler dough and melty vanilla ice cream. This recipe is very easy in the sense that it doesn't require the use of any fancy kitchen tools (no stand mixer) and none of the ingredients have to be brought to room temperature, which is always a huge plus when you're in a time crunch. I know it isn't quite strawberry season yet and for that reason, I have added the option for you to add more or less sugar, depending on how sweet your berries are. Preheat oven to 350°F. 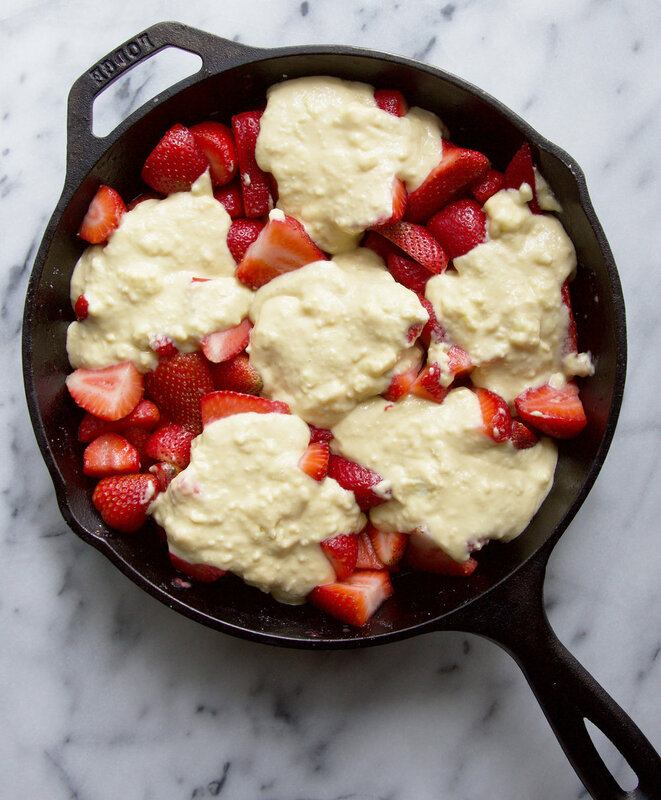 Mix together strawberries, sugar, cornstarch and lemon juice in a 9 or 10” skillet (this could be done in a separate bowl, but why wash another dish!). Set aside. For the cobbler: In a medium-size bowl, whisk together flour, sugar, baking powder, lemon zest, and salt. Add cubed butter to the bowl, and with a pastry cutter (or your hands) mix the butter into the flour mixture until well incorporated and small pieces/crumbs remain. In a separate bowl, whisk milk, egg and vanilla extract and then add mixture to the dry ingredients. Mix until a dough forms. Add 5-6 spoonfuls of dough over the strawberries and bake in the oven for 35-45 minutes, until the cobbler is cooked through and golden brown. Serve immediately with vanilla ice cream and enjoy! Sidenote: I have eaten this the next day straight from the refrigerator and I can safely say that it is just as amazing as straight from the oven.